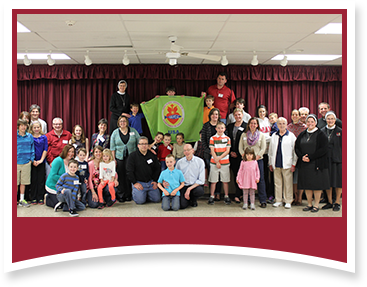 GFASC (Grande Famiglia del Sacro Cuore - Great Family of the Sacred Heart) is a mission for the family who desires to be consecrated to the heart of Jesus and to live an authentic Christian life following the charism of Mother Clelia Merloni. Members seek to witness to the love of the heart of Christ though a life of service and reparation. The aim of GFASC is to lead each person to the source of life, Jesus Christ, in order to rebuild the family through prayer and faith-filled, loving service. Learn about Sacred Heart devotion and Mother Clelia Merloni. Consecrate their families to the Sacred Heart of Jesus. Witness to the love of God for others in the spirituality of the Sacred Heart and the charism of Mother Clelia Merloni. Journey with other families and support one other in a desire to live an authentic Christian life. Support the mission and vocations of the Apostles of the Sacred Heart of Jesus with their prayers. For more information about GFASC, contact Sr. Bridget Smith via email.